I truly don’t think people realise the severity of this. I have posted many posts with regard to this very subject and hardly anyone has acknowledged it. As you quite rightly point out, this IS an attack on democracy and WILL be the end of democracy. I think democracy is already questionable in this country, this will be the full stop. I think I’ll re-post a few of my other TTIP articles on the Facebook page, just to back this up. Brilliant, I will look out for them and share if I can. I put everything on ‘Public’. If you wish you can tag me in: Please look for Fronch Resist-once on Facebook. This is exactly what we need – international solidarity! Here in the UK I am sure many more people would oppose TTIP – if they knew about it. Most of the population is not even aware that it is being discussed. Are there any more readers in Europe who oppose this proposal? Perhaps we could form an international organisation against it. “Will there be a motion in Parliament any time soon?” I wish I could say yes because everything we are seeing now under Austerity is all the grand plan for TTIP and is why we are not hearing the right soundbites from Labour. Of course we have no say on the outcome of TTIP whatsoever, because it is being “negotiated” by our unelected governors the eussr commission, and will be subject to qualified majority voting should there be enough worries presented by enough national elected governments, the elected eussr parliament will as ever wave it through. Westminster as with every other trade agreement that Britain is involved with will have to kow tow to the commission. Is that Barry Davies? If so, your use of the fascist expression ‘EUSSR’ has given your identity away. You seem to have little respect for our current version of democracy, and you’re probably right, but when there’s no other choice, we have to do what we can. We DO have a say on the outcome of these negotiations. If our wishes are ignored by our elected representatives, then it is our duty to vote them out at the next opportunity. That’s how democracy works. It’s that simple. I read the headline of this post and was filled with astonished relief. “TTIP on the rocks”. Unfortunately, I was cast down into utter despondency again. I’m Canadian, now living in England. 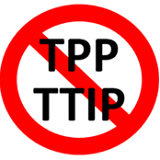 Michael Meacher is right – NAFTA was/is nasty and TTIP will be too.